As China Airlines ramps up the pace of its fleet renewal programme, we took a close look at one of the carrier’s new Boeing 777-300 aircraft on static display at Paris Air Show. This will be aircraft No 6 delivered to the airline, out of an order of 10. This is one of the first NexGen B777 aircraft offering cabin design options originally developed for the Boeing 787 Dreamliner. A distinct aspect is the “Sky Lounge” entrance where customers board the aircraft – this space has a vaulted ceiling and ambient LED lighting designed to psychologically decompress customers after the stresses of the airport experience and walking down a narrow airbridge. It certainly creates an enhanced atmosphere at this initial touchpoint. 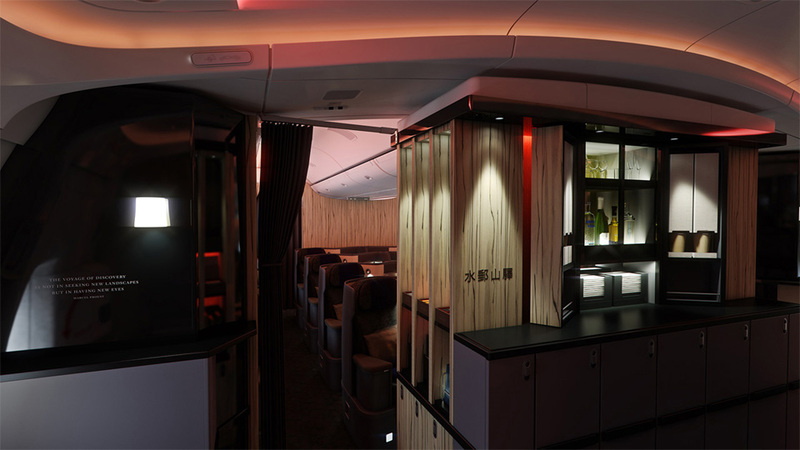 China Airlines are amongst the first to use wood grain finishes throughout the aircraft and this offers something unexpected and different – around the aircraft there are 7 subtle surprises for customers to look out for, including words from Proust on the galley wall. 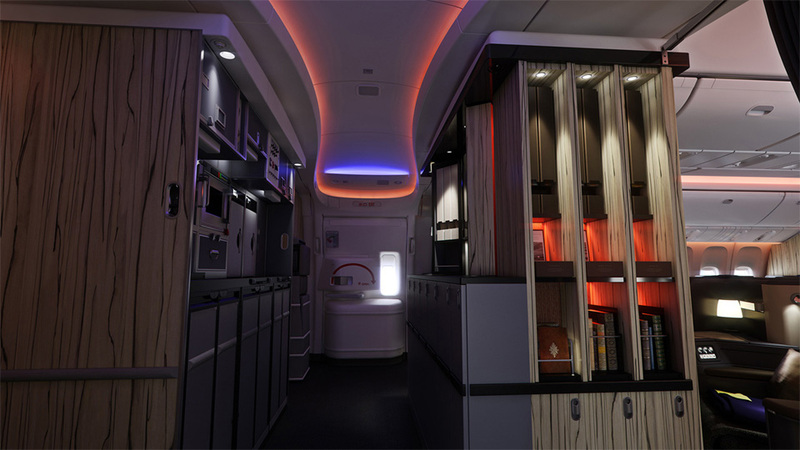 The galley space in Business Class cabin has wood panel finishes, and service cart storage areas are noticeably inconspicuous through use of smart doors. The small details such as the noodle bar and tea / coffee stations are nice touches and the effort to make all areas of the aircraft welcoming and pleasant for customers is clear to see. Does the hard product quality match the interior décor? The answer is a resounding, yes. 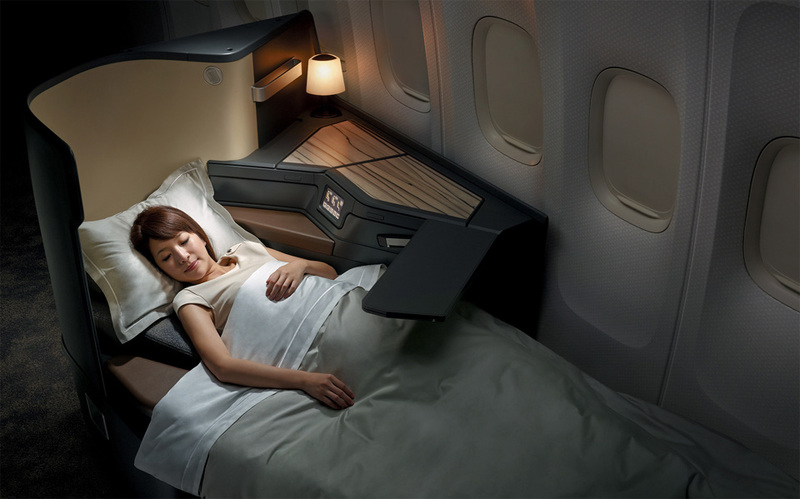 From front to back China Airlines has set new benchmark standards within its fleet – the 40-seats in Business Class are flatbeds and all have direct aisle access with a 1x2x1 layout. The 18-inch IFE screen is amongst the largest available. All of the expected connectivity elements are available including a power outlet, 2 USB sockets as well as WiFi Internet. A nice touch is the personal table lamp available on each seat console. 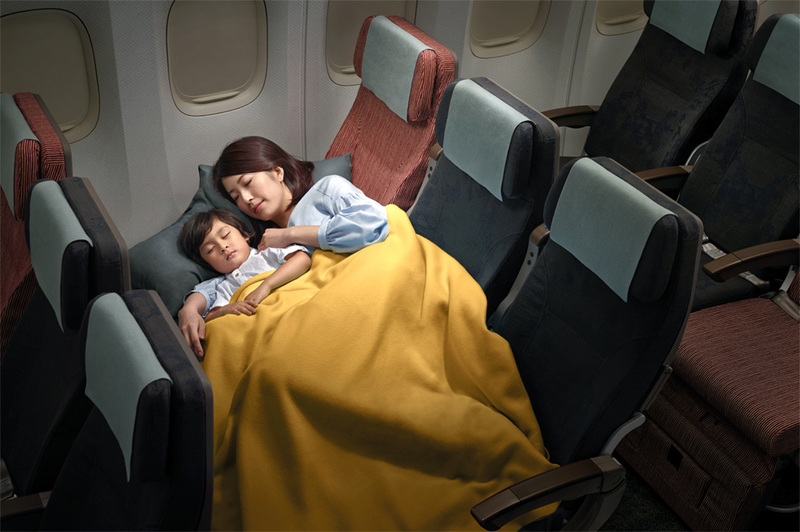 In the Premium Economy cabin, China Airlines have opted for a 39-inch seat pitch – which is only bettered by a very small number of airlines. The non-intrusive seat recline protects each customers personal space, a particularly important feature for business travellers. The 12-inch PTV screen is a strong feature of this seat as well as the power socket and USB connections. In Economy Class a much talked about feature is the Family Couch (licensed from Air New Zealand) which allows 3-seats to be converted into a larger bed. This is fitted with a mattress topper, pillows and blankets by the cabin staff. Having tried the seat it is certainly a step up in comfort, but taller customers may find the bed length on the short side, and 2 larger adults may find the available space too tight. This is a product only for the closely acquainted! 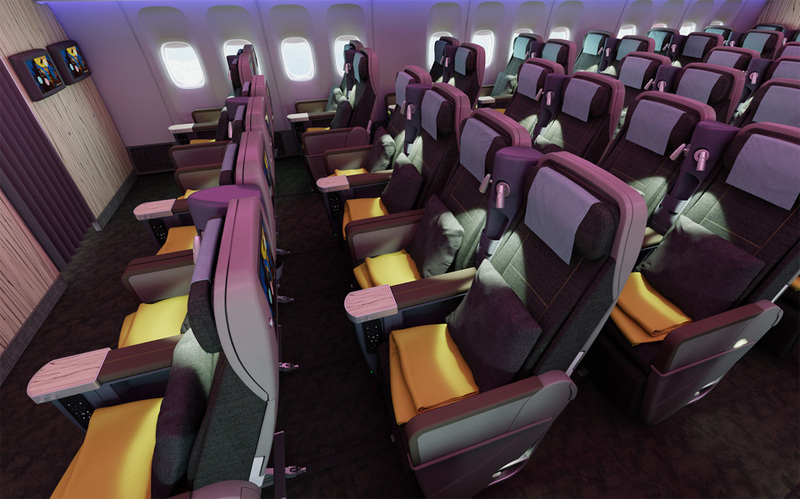 The standard Economy Class seats are configured in the higher density 3x4x3 – through the use of thinner seat panels and armrests the personal space feels good and it is likely to be at the shoulders where some customers may notice the reduced width. One nice design feature of the Economy Class cabin is the location of the power sockets on the forward seat, which should mean an end to the days of scrabbling around on the floor trying to locate the in-seat power. The 11-inch IFE screen is again a nice size considering the viewing distance and represents a real upgrade from many older China Airlines aircraft. These new Boeing 777-300ER aircraft now see China Airlines performing at a very competitive global standard in all 3 cabins, and the attention to detail in the aircraft design (whilst eclectic) certainly makes China Airlines stand out in what is an increasingly competitive crowd. 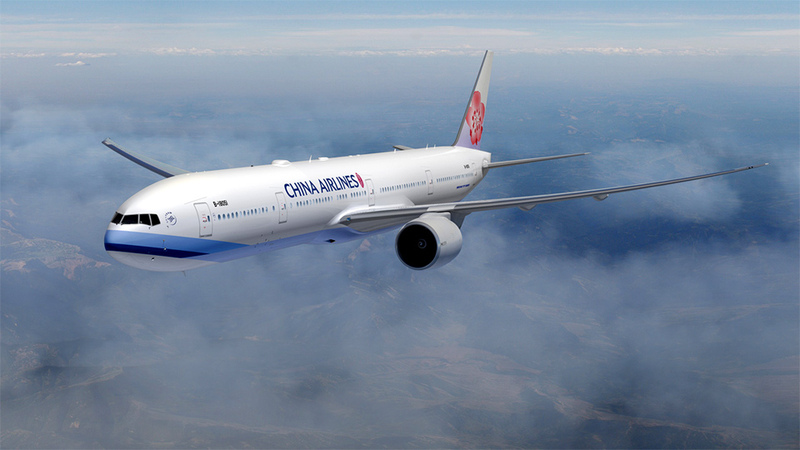 We expect the A350 being introduced to China Airlines fleet in 2016 to follow a similar product and design format.